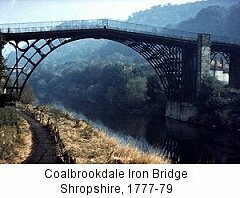 Prior to industrialisation, design didn't have an autonomous existence, it was indivisible from Fine Art or Craft. Appealed to refined "good taste"
Good quality items to keep as heirlooms. Later 18th Century: development of Industry. Designers for new industries usually architects and fine artists. Adaptation of fine art styles to design, such as Rococo, Neo-classicism, Chinoiserie (Chinese style). New market: Middle class buyers wanting the prestige associated with aristocracy. Design has been shaped by the forces of mass production & mass consumption: novelty of design became the basis of commercial success. Designers have an important role as agents of change. Design is a vehicle for aesthetic and social communication; a carrier of subtle or blatant meanings. Definition of Neoclassicism: A revival in the 18th and 19th centuries of ancient Greek and Roman art styles, characterized by order, symmetry, and simplicity of style. A contemporary of Chippendale, best known for his brass inlaid furniture. This example is a mahogany cabinet in the Rococo style, of which style he is said to be one of the founding fathers in England. Definition of Rococo: A style of design, painting, and architecture dominating the 18th century, often considered the last stage of the Baroque. Developing in the Paris townhouses of the French aristocracy at the turn of the 18th century, Rococo was elegant and ornately decorative, its mood lighthearted and witry. 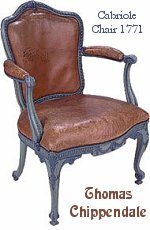 Louis XV furniture, richly decorated with organic forms, is a typical product. Leading exponents of the Rococo style included the French painter Antoine Watteau (1684-1721) and Jean-Honoré Fragonard (1732-1806), and the German architect Johann Balthasar Neumann (1687-1753). Rococo gave way to Neo-classicism. Wedgwood's success based on ability to make good quality wares and to cater for a defined market: knowing what people wanted to buy. Perfected creamware, an earthenware material used for making dinner sets. With royal patronage, it was labelled Queen's ware. Became one of the most successful industrial ceramic wares. 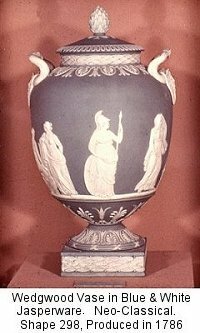 Invented Jasperware, a fine stoneware used for vessels in the Neo-Classical style (18th-c designs still produced today). Search Google for "Josiah Wedgwood"
Wedgwood's rival, who claim to the the 'original' manufacturers of Fine China. Josiah Spode, like Wedgwood, was a great innovator. He developed several processes including a superior formula for Fine Bone China, and the development of the process of laying a blue underglaze. One of their most popular styles, Willow, is a classic example of Chinoiserie. Definition of Chinoiserie: Western imitations or evocations of Chinese art. 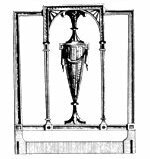 The term is usually reserved for objects made in the 17th and 18th centuries. Once the process of transfer printing designs was developed (allowing effective mass production), a great number of manufacturers sprung up. Rather than a handpainted luxury for the upper classes, dinnerware became far more affordable. 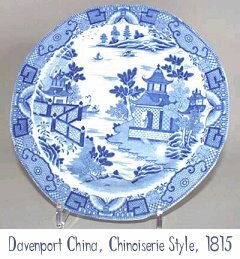 From Spode's original Willow pattern, many spin-offs developed. These are often called the "Blue and White" style, of which there are hundreds of manufacturers and patterns. Some of these have been continuously produced for over two centuries. 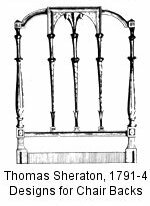 Thomas Chippendale reorganised furniture production by giving workers increasingly specialised tasks, by making production methods more efficient, and by integrating marketing into production; but mass production was achieved later, in the 19th-c. Furniture design strongly influenced by architecture: Classical, Rococo, Chinoiserie, Gothic etc. Decoration of structure was important because "ornament signifies wealth" (Ibid) - concept of status and respectability as a commodity. 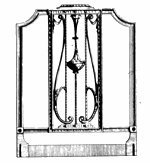 Chippendale supplied furniture and an interior design service to his customers: an integrated service. 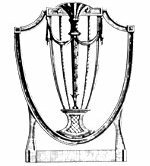 Search Google for "Thomas Chippendale"
Matthew Boulton commercialised the metal industry. 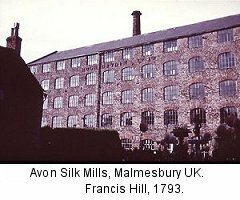 He adopted new technology of steam power for his factory, which also influenced the industrialisation of textiles. He combined manufacture and merchandising under one roof. 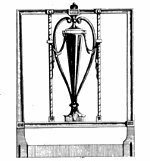 Like Wegdwood, Boulton consistently imporved techniques and products, making a wide range of products of high standard in various materials including polished steel jewellery, silver-plated cutlery. metal buttons, buckles, tools, trinkets etc. His works include Rococo and Neoclassical pieces. 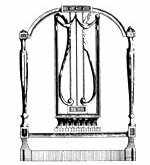 Search Google for "Matthew Boulton"
It's so difficult to fit Michael Thonet into a neat little box because he was in so many way apart from his time. I've put him in Design Pioneers as his early designs influenced Modernism in their simplicity. 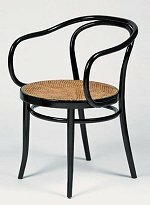 Le Corbusier used Thonet's bentwood chairs in his houses and over 40 million Thonet chairs have been produced. His processes for bending wood and the idea of interchangeable components and flatpacking have been among the most influential ideas in modern furniture production and design. Textiles and fashion were also changing very significantly during this period. References: Based on lecture notes prepared by P. Garn-Jones. Additional material by Kat Black.